Perpetual parish: Father Fadi Salame in St Maroun’s, Greenslopes. Photo: Emilie Ng. In the Catholic Church, April is traditionally dedicated to a particular focus on the Blessed Sacrament. 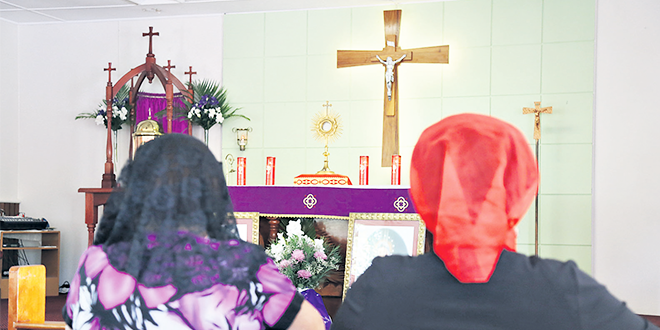 Brisbane’s Maronite Catholic parish, St Maroun’s in Greenslopes, is especially dedicated to that devotion this month and has been for the past six months. The parish is one of only two known Maronite churches around the world offering perpetual adoration for 24 hours, seven days a week. 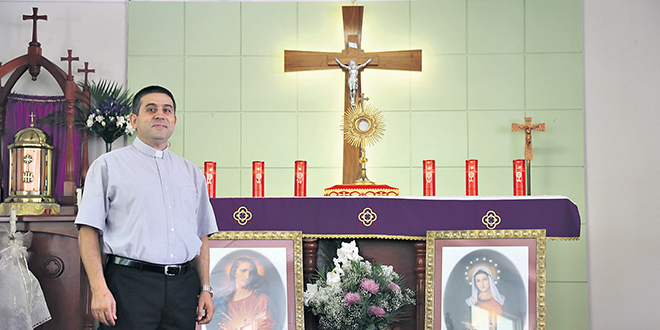 Parish priest Fr Fadi Salame discusses why he has opened his church day and night for Catholics to pray before the sacrament. Q: What prompted you to keep the church open 24/7? A: It started on August 28 (last year). There was a group, a Filipino group, called the Alliance of the Holy Family International, or AHFI. They asked me two years ago to try to have adoration here and we planned to have it downstairs in the church, in a little hall we have. But the problem was we are using the hall, so every time we needed to use it we would have to move the sacrament up and down. Finally I agreed with them, and I said to them, “Let’s have the church. The church will be open day and night for you and you can have adoration.” If we have any special occasions, we can put the sacrament aside as we continue our rites and celebrations, and they can have adoration after. So the Filipino group is taking care of it, and now maybe 10 people from my parish, they are now attending adoration. They’re having a special time. Some of them come early morning, some afternoon, during the day and evening. It was a very good idea and the decision was really hard to take. But when we took the decision, I really thank God daily about the adoration. It’s a blessing for our parish, for the whole archdiocese and, because Australian people are now attending the adoration, it’s a blessing for them and this area. Q: Are some of the blessings visible or more spiritual? A: About visible blessings, you see more people coming to church, attending Masses and adoration. And, you know, about spiritual, God knows what’s happening in the hearts and minds of people who come to the church. The change that occurs in their hearts and minds, we don’t know about it. But we believe that exposing the sacrament for six months, it’s already done a lot of changes in many lives of people here in this parish. My bishop (Bishop Antoine-Charbel Tarabay), the last time he came, he mentioned at the Mass that it’s very special to have adoration 24/7 here in Brisbane. Q: The norm for perpetual adoration, as outlined by the Church’s liturgical documents for exposition of the Blessed Sacrament, require the faithful be present during all times of exposition. Has this been happening at St Maroun’s for the past six months? A: Yes, sometimes three, four, five people; it depends, but at least one is there especially during the night-time. Some of them come in groups of two people. And they’re happy. And I think Our Lord is happy too, to have this special open prayer day and night. Q: Opening your church here in the Brisbane archdiocese is also responding to a call from Pope Francis to open churches during the Year of Mercy. But while he specified it for one particular day, you have extended it to six months. A: Yes, hopefully we expect more people to join the group so some of them can have rest rather than coming two or three times a day. Because, you know, it’s very hard for people to come two or three times daily. Maybe in the future we can have more people so we can divide the work, the prayer, among different people of different ages. In saying that, we now have more than five youths doing adoration weekly, sometimes two days a week. Q: Is there a specific tradition particular to the Maronite rite with regards to adoration of the Blessed Sacrament? A: No. Everyone can say, pray whatever he wants in front of the Lord. We’re not saying you have to pray this or that. But during the adoration here, every group that comes to the church has to pray for Pope Francis, for the Maronite Patriarch, the Maronite bishop too, and sometimes for the parish priest, for me (laughs). And they’re praying for Archbishop Mark Coleridge and for everyone working in this archdiocese too. Q: Have you got your own holy hour? A: I’m trying, but not like them (the Filipino group). I’m trying but as a parish priest I’m not having anyone to help me. I’m trying to attend as much as I can. Q: What are your prayers when you are before Our Lord? A: Sometimes I pray the Office, the morning or evening prayer, the Rosary, the Divine Mercy, psalms and songs from our tradition. Sometimes I play the organ so I can do it twice because when we sing we are doing the prayer twice. I’m saying Masses for the group every two weeks, when we change the consecrated host. I’m saying in the Latin rite, because I am bi-ritual, so I can say Maronite and Latin Mass too. During the week I’m having two Masses on Tuesday and Thursday, and other days I’m saying Mass by myself.